Indian River’s defense picks up a sack in the Indians’ win over Seaford on Friday, Oct. 12. It was a long four weeks for the Indian River High School football team. Throughout their four-game losing streak, the Indians continued to hold their heads high and worked extra-hard in practice, knowing that they were just a break or two away from changing their recent misfortunes. That positivity, hard work and perseverance paid off in a big fashion last Friday, Oct. 12, when the Indians came from behind to defeat Seaford, 29-28, to spoil the Blue Jays’ Homecoming celebration. A 30-yard field goal from River Vickers with just over a minute remaining in the game lifted the Indians to a win that was a total team effort from start to finish. The Indians ran 61 plays in the game and gained 262 total yards on offense. Sophomore Tyler Bowen connected on 7 of 16 pass attempts, for 82 yards. Senior receiver J.J. Killen hauled in five of those passes, for 74 yards, which included a big 4th-and-2 conversion for 20 yards. Junior Nicholas Angelo caught two passes for 8 yards, including a touchdown. IR did most of their damage on the ground, with a quartet of guys getting in on the action. Freshman Dalton Hall led the way with 51 yards on 14 totes. Ta’Jon Knight (51 yards), Reshawn Turner (33 yards) and Bowen (16 yards) all scored touchdowns. Defensively, the undersized Indians battled inside the trenches, but the Blue Jays still managed 347 yards of total offense, with 227 of those stripes coming on the ground. Quarterback Isaiah Lake connected on 6 of 11 passes, for 120 yards. The Indians — now with a 2-4 record overall — forced three turnovers, with the biggest of them coming from a Killen interception deep down the sideline to preserve the win in the waning seconds of the game. Jodiah Morris and T.J. Moore led the defense with eight tackles each, while Zach Schultz and R.J. Rybicki both were credited with five. Turner added four stops. Freshman T.J. Burke and Knight each had fumble recoveries. 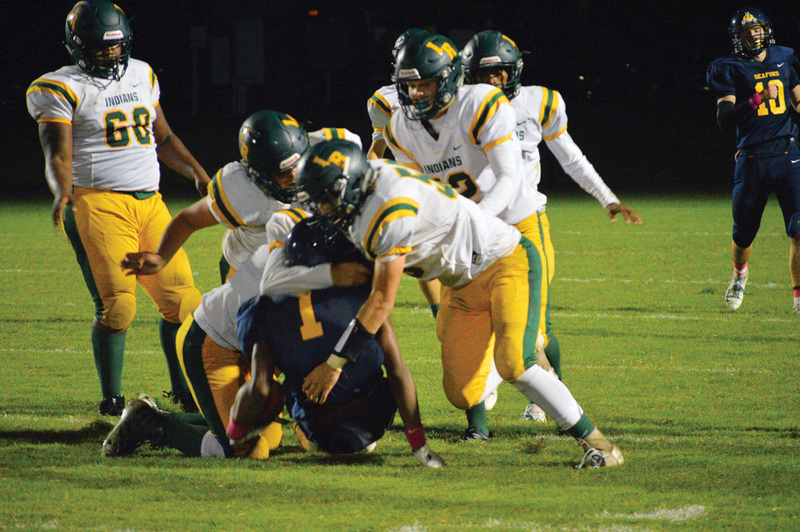 IR will take on the Laurel Bulldogs on Oct. 19 at home, with kickoff scheduled for 7 p.m. It will be Homecoming for Indian River. Laurel comes into the contest with a 3-3 overall mark and fresh off a 35-6 win over Polytech last week.